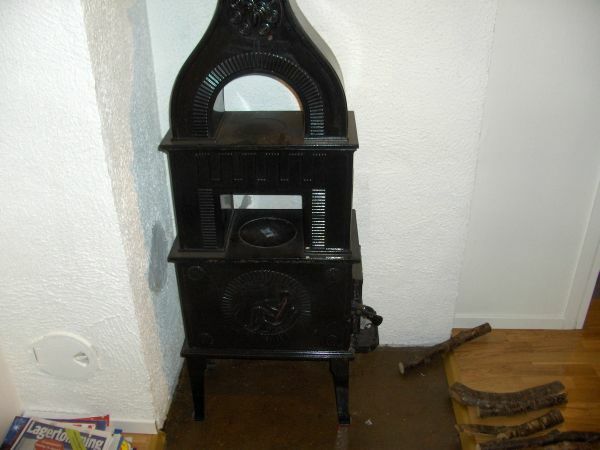 A hopefully sharper picture of the wood stove and the firewood. Also notice its shape that increases the surface area so it can radiate more heat, and the small cooking plate on the lowest tier. I’m in the Mothhouse again (in the idyllic rural hamlet of MÃ¸ll, upriver from Mandal on Norway’s south coast.) Â I had planned to be here yesterday, but went home to unlock my mobile phone instead. Today, however, the phone has worked quite fine – in fact, I am using it to connect my laptop to the Internet as I am writing this. Â The GPS also worked, perhaps because I started it earlier. Or perhaps there is some other random reason, what do I know. Â I wonder if I am still going to rely on it a month from now? Â Probably not – you do get a feeling for distance eventually. Â I still have been here only about half a dozen times though, if that. Anyway, as I’ve said before, there is unlimited wood. Â The landlord has said that I can use as much as I want, so that should help offset the electricity cost. Â Which I don’t know how much is. Â For future reference, the meter is today at 6623 KWH. Â It was 5782 when I took over the electricity here, according to the letter from the utility company. Speaking of electricity and heating, I left the heat pump on 16 degrees Celsius when I left on Friday. Â (That would be 61 degrees Fahrenheit, for those lazy bums who can’t be bothered to use Google to translate into tribal measurements. Â Type “16 c in Â f” in a Google search field and you will get 60.8 as answer.) This is the lowest ordinary setting. Any less and I would have to switch to the maintenance setting that runs 10 degrees above the freezing point. Â This would likely be cheaper, but the house would be distinctly chilly on my return. Â In fact, the outside temperature was not much lower than that today. As it was, however, the house was pleasantly mild even before I fired up the wood stove. Â In particular I was surprised to find that the bedrooms upstairs were quite a bit warmer than outside. Â The bedroom floors felt nicely warm to my feet when I still only the thin socks. Â A property of warm air is that it rises upward, after all, so perhaps I should not have been surprised. Â It is not as if there is some secret cold void between the two floors. Â The floors of the bedrooms are the ceiling of the living room and study, after all, only with some thick timber structure between them to support the weight. It is not like the space between them is open to the wind or anything. Unfortunately, cold air does not rise in summer, so I better hope the nearby river keeps the heat from becoming too intense. Â But that is far into the future. Â Who knows what may happen before that. Anyway, I used another brand of noodles this time. Just in case. This entry was posted in slice of life by itlandm. Bookmark the permalink. I am not a lazy bum who refuses to learn Celsius. I can approximate in my mind, but not with any degree of accuracy. And I know how to look it up, thank you! It just seems like cheating, and I hate doing it. Makes me feel even dumber than I already feel because I don’t know the equivalent temperature! Hopefully, if things get too hot upstairs in the summer, you can find a place to make yourself a sleeping spot downstairs somewhere. Maybe? And an hour’s walk to the bus stop? That’s a lot. When do you need to be at work? And how long is your bus ride? And what will you do when the weather is bitter and blowing? Is there any risk of you being lost in some howling storm between the house and the bus? That’s scary. No, no! The 50 minute forced marsh is HERE, not at the Mothhouse! And it only happens when I take the bus from Mandal late in the evening. The Mothhouse is about a minute from a bus route between Mandal and Kristiansand. And yes, if it gets unbearably hot in the summer, I could either sleep in the home office (air condition) or the hallway outside the washroom, where there are no windows to let the sun’s heat in during the day. But first we need to get to the summer. It is an ocean of time, to me. And of course I believe souls exist. I’m fairly stupid as to their nature (you explained soul vs. spirit at one point, but I could use the explanation again since it’s been a few years and my mind is like a sieve these days), but they are interesting to contemplate, not to mention making existence worthwhile (as a rule). Oh, thank God! I was confused. I thought you left the Mothhouse and were timing how long it took you to walk from it to the bus stop! Since I’m frequently running late (I’m actually ready before the rest of the family, but run around herding them into some semblance of presentableness and getting them out the door), I’d eventually either drop dead or get into really good shape what with my hour-long RUNS to the bus every morning! I’ve been worrying about that, and whether you might just need to get a car!